I remember when I was still starting to bake I tried few instant mixes first before baking from scratch. After learning how to bake from scratch I never bought any instant recipe mix but last month I bought this Ghirardelli Triple Chocolate instant mix. I’m not familiar with the brand maybe because it’s imported but since it was a sale I bought 1 box good for six batches. I baked it yesterday and I just told my husband that we have brownies inside the fridge if he wants to bring some in the office. My son and I ate this during our breakfast and then few minutes ago I received a text from my husband and he said “sarap ng brownies”. I hate to admit but this triple chocolate instant mix is better than the two brownies recipe that I baked from scratch. 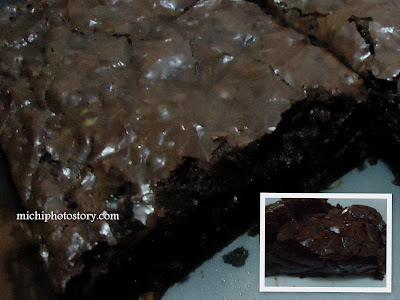 This brownie is so rich, dense, chewy and chocolate-y. It is a balance of semi-sweet, milk and bittersweet chocolate chips. I’m not fan of ready mixes but after tasting these brownies, I will definitely buy this again. It is starting to convince me that I will not bake brownies from scratch again. Hehe! Another thing is it is so easy to make, I just need to add water, oil and egg. I'll check the site. thanks! this is the same brownie mix na binili ng mommy ni boyfriend sa S&R... di pa nya naluluto... cge, makikitikim ako kay manong ariel... inalok nya ako kanina eh... hahaha! natikman ko na... ang sarap nga!.. swerte ni manong ariel sayo.... hehehe! Masarap nga yan natikman ko na din! Yung betty Crocker binili ko kasi di ko pa natitikman at mas mura yun. hehe! Yung halloween picks sa ebay ko nabili. Yun nga palang sa bato springs malapit yung Diuata hut na ni rent namin sa man made spring pero medyo malayo sya sa swimming pool. OA sa dami ng langaw pati kami nilalangaw. hahaha! Siguro kasi konti lang guests nun kaya samin lahat halos nagpuntahan ang mga langaw kasi masarap food namin. lol!. may nabili ko na betty crocker din, di ko pa natry. parang nadidiscourage talaga ko pumunta sa bato springs dahil sa langaw. hehe! for sure masarap food niyo, kayo pa.
mukha sa S&R lang, hindi ko pa siya nakita sa ibang grocery e.
My hubby is thinking of becoming a S&R member (because of their new york style pizza). I love brownies but I haven't tried baking anything yet, so I'm interested into trying this. I hope it's easy. hehe! it is also our first reason why we want to become a member. this ready mix is so easy, try it!